Slippery elm (Ulmus rubra), known variously as Indian elm, sweet elm, red elm, and moose elm, is a deciduous tree native to North America, particularly the eastern and central United States and eastern Canada. 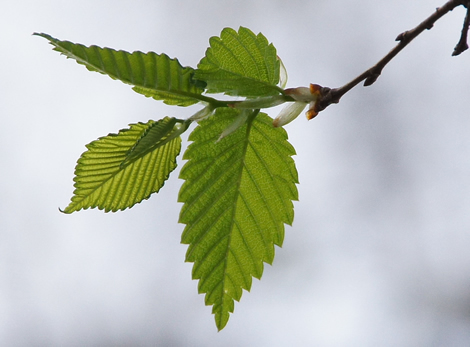 Slippery elm is smaller in stature than other members of the Ulmaceae, or elm, family. There are about twenty species of elm. The slippery elm can grow 50-60 ft (15-18 m) in height with a trunk measuring one to four feet in diameter. Its exterior bark is dark brown, rough, and fissured. The mucilaginous inner bark is white with a distinctive scent. The tree flowers in early spring before it comes into leaf. Flowers bloom in dense and inconspicuous clusters at the tips of the branches that spread out into an open crown. The stigmas of the blossoms are bright red. The downy leaf buds are rust colored with orange tips. The alternate leaves are dark-green, hairy, and abrasive on top, and a lighter green, hairy, and less abrasive on the underside. Leaves are 4-7 in (10-18 cm) long and oblong to ovate with irregularly toothed margins. The seeds are contained in flat round paper-thin fruits and grow in clusters. 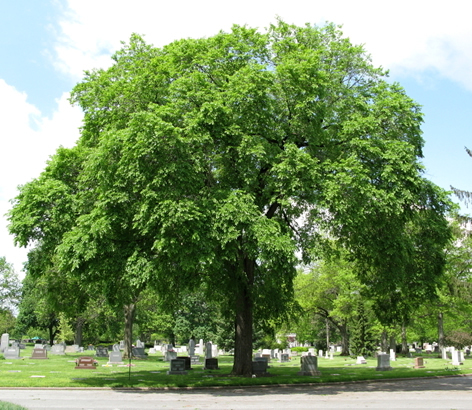 The slippery elm is a rare or threatened species in some parts of the United States, particularly in the north-eastern U.S. where Dutch elm disease has devastated the elm forests. Its usual habitat is along stream banks and in woods. Harvesting the medicinally valuable and nutritious inner rind involves stripping the tree of large segments of the outer bark. This often results in the death of the tree, further diminishing its presence in the wild forests. Native American herbalists included the mucilaginous inner bark in their medicine bags, and found numerous other uses for the pliable slippery elm bark, including using the fiber for making canoes and baskets. Native American herbalists shared their herbal knowledge with the early colonists, who came to rely on the slippery elm as one of their most valued home remedies. Midwives used slippery elm as a birth aid because its lubricant properties eased labor. Early settlers called the inner bark of the tree “slippery-elm food.” The boiled bark was an important survival food for both the Native Americans and the colonists during times of famine. George Washington and his troops are believed to have subsisted for several days on gruel made from slippery elm bark during the cold winter at Valley Forge, Pennsylvania. A poultice made from the inner bark was a field dressing for gunshot wounds during the Revolutionary War. The dried inner bark of the slippery elm, known as the bast, is a calcium-rich, nutritive substance containing bioflavonoids, a high amount of mucilage, starch, a small quantity of tannins, and vitamin E.
Slippery elm in various preparations acts as a demulcent, emollient, expectorant, diuretic, and is a soothing and nutritive tonic benefiting the adrenal glands, the respiratory system, and the gastrointestinal tract. The inner bark, taken as an infusion or syrup, has been used to treat sore throat, laryngitis, bronchitis, and stomach or duodenal ulcers. 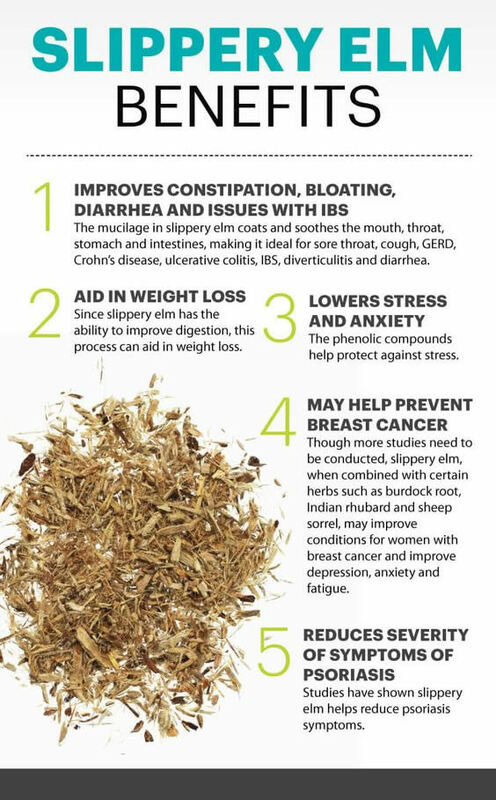 Slippery elm is a healing remedy once widely used to treat consumption, known now as tuberculosis, and typhoid fever. The mucilaginous substance in the inner bark is soothing to irritated tissues in the lungs, intestines, colon and urinary tract, and may be helpful in the treatment of Crohn’s disease, an inflammation of the walls of the small intestines and colon. Slippery elm helps to draw out toxins from the body and assists the body in expelling mucus. It is beneficial externally in poultice form. When the inner bark is mixed with water, the soothing and emollient substance can be applied to the skin as a healing salve for numerous skin problems. It can be used for diaper rash , bed sores, abscess, burns, scalds, infections, and boils. Slippery elm may be combined with such other soothing herbs, such as echinacea, goldenseal, and comfrey, in a salve preparation to soothe and bring healing to inflamed and infected skin. A gruel or paste of slippery elm mixed with water is useful as a nutritive food for invalids who may be unable to keep down regular food. When an infusion of ginseng is used in place of the water, the tonic effect of this herbal food will be enhanced. Slippery elm was listed in the U.S. Pharmacopoeia and the National Formulary from 1820 until 1960. The Food and Drug Administration has listed slippery elm as a safe and effective remedy for soothing throat and respiratory inflammations and as a digestive aid. More recently, slippery elm has been studied as a possible antioxidant. Antioxidants are compounds that counteract aging and other destructive effects of oxidation in living tissue. One group of Korean researchers found that slippery elm extract inactivates peroxynitrite, an oxidizing compound that causes cell death. British researchers have also studied the antioxidant effects of slippery elm, which they think explains its effectiveness as a treatment for irritable bowel disease (IBD). Maude Grieve recommended in her 1931 book, A Modern Herbal, that only 10-year-old bark should be harvested. She listed numerous recipes for medicinal preparations using slippery elm bark in combination with other healing herbs for specific applications for many illnesses. The most common commercially available slippery elm products on the market today are in the form of throat lozenges and teas. Powdered bark: Euell Gibbons, an American herbalist, suggested a way to prepare slippery elm for storage or use. Separate the inner rind from the outer bark and place the strips on an oven shelf at a very low temperature. Leave the door slightly ajar. Slippery elm “gruel”: Slowly add fresh, cold water, a little at a time, to the finely powdered bark. Stir until the mixture reaches the consistency of a thick porridge. Sweeten with honey and add cinnamon and ginger to taste. Refrigerate unused portions. Milk may also be used in place of water. Infusion: Bring one pint of fresh unchlorinated water just to the point of a boil. Pour over one ounce of the powdered slippery elm bark. Steep until the mixture is cool. Add lemon and honey to taste. Drink freely throughout the day. Use care when purchasing slippery elm products. Avoid those that are wildcrafted (harvested in the wild) to minimize depletion of this endangered American native tree. As of 2002, slippery elm has not been reported to interact with any prescription medications. it is best to take slippery elm several hours before or after other herbs or medications because of possible interference with speed of absorption.